Silver Leaf E174 is Pure Silver from pure silver and is finer than a piece of tissue paper. Edible Silver Leaf is harmless to be eaten and is digested very easily by the body and deemed safe by the European Union. 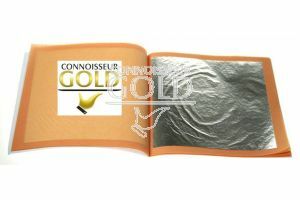 Edible Silver leaf is gaining in popularity as an edible food additive and decoration especially for Silver Wedding Anniversary.. It can be used to garnish all types of dishes, giving food that special look and feel. From a simple garnish to dish to the wow factor on a wedding cake it really does give it a special feel.